Backup protects your precious files by keeping a copy safely online. It's hassle-free, easy to install, completely secure, and backs up your entire PC or Mac, no matter how many files you have! Backup works in the background to protect your files as you use your computer. It backs up all of your files - no matter how many you've got. You can restore your files at any time with one click. You can be sure your files are safe and secure. Multiple copies of your files can be accessed at any time, and we encrypt them with military-grade encryption, so that they're completely private. Backup your whole PC or Mac, no matter how many files you've got. 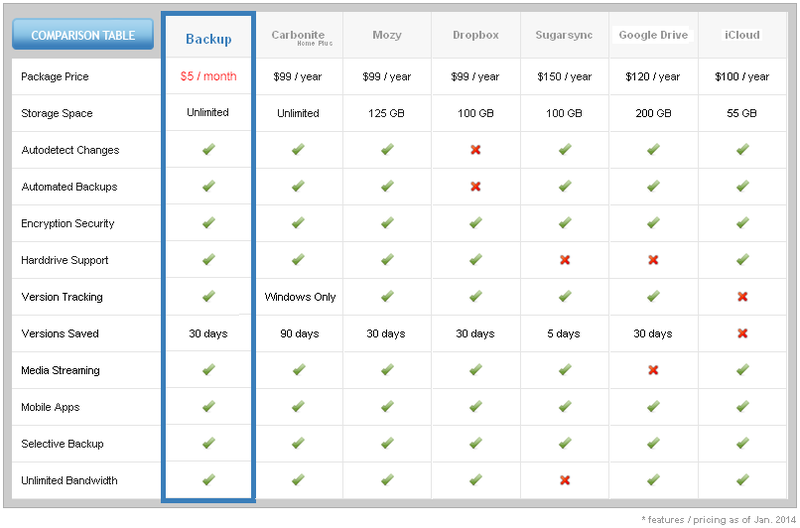 Backup is your personal storage space on the Internet. It's unlimited, it's secure and it's there forever. View your backed up files anywhere - from any computer, mobile or tablet. View photos, watch videos, listen to music and work on your documents from your backup center. Need to revert a change you made? File overwritten? No problem. We even keep your deleted files for 30 days. Restore files or entire folders at any time with one click. Whether PC or Mac, we've got you covered. Unlike other services that don't backup Mac or have manual video backup, your backup is automatic and good for your whole household.